…any short run gains from delay tend to be outweighed by the additional costs arising from the need to adopt a more abrupt and stringent policy later.7 An analysis of the collective results from that research, described in more detail in Section II, suggests that the cost of hitting a specific climate target increases, on average, by approximately 40 percent for each decade of delay. These costs are higher for more aggressive climate goals: the longer the delay, the more difficult it becomes to hit a climate target. Furthermore, the research also finds that delay substantially decreases the chances that even concerted efforts in the future will hit the most aggressive climate targets. …The data set for this analysis consists of the results on all available numerical estimates of the average or total cost of delayed action from our literature search. Each estimate is a paired comparison of a delay scenario and its companion scenario without delay. To make results comparable across studies, we convert the delay cost estimates (presented in the original studies variously as present values of dollars, percent of consumption, or percent of GDP) to percent change in costs as a result of delay.20 We capture variation across study and experimental designs using variables that encode the length of the delay in years; the target CO2e concentration; whether only the relatively more-developed countries act immediately (partial delay); the discount rate used to calculate costs; and the model used for the simulation.21 All comparisons consider policies and outcomes measured approximately through the end of the century. To reduce the effect of outliers, the primary regression analysis only uses results with less than a 400 percent increase in costs (alternative methods of handling the outliers are discussed below as sensitivity checks), and only includes paired comparisons for which both the primary and delayed policies are feasible (i.e. the model was able to solve for both cases).22 The dataset contains a total of 106 observations (paired comparisons), with 58 included in the primary analysis. All observations in the data set are weighted equally. Analysis of these data suggests two main conclusions, both consistent with findings from specific papers in the underlying literature. The first is that, looking across studies, costs increase with the length of the delay. Figure 2 shows the delay costs as a function of the delay time. Although there is considerable variability in costs for a given delay length because of variations across models and experiments, there is an overall pattern of costs increasing with delay. For example, of the 14 paired simulations with 10 years of delay (these are represented by the points in Figure 2 with 10 years of delay), the average delay cost is 39 percent. The regression line shown in Figure 2 estimates an average cost of delay per year using all 58 paired experiments under the assumption of a constant increasing delay cost per year (and, by definition, no cost if there is no delay), and this estimate is 37 percent per decade. This analysis ignores possible confounding factors, such as longer delays being associated with less stringent targets, and the multiple regression analysis presented below controls for such confounding factors. The entire report is here. See also this post. The usual skeptics of anthropogenic climate change can refer to this post. This entry was posted on July 29, 2014 by Menzie Chinn. What percentage of climate change is caused by people (compared to all the other factors)? If people have a significant effect on climate change, haven’t we done enough already to stem climate change in this deep depression, that may turn into a “lost decade” or two, where the U.S. is underproducing by $1 trillion a year, along with slowing global economic growth? Why do anything, because of the natural decline of fossil fuels on climate change. from production and technology. <i.What percentage of climate change is caused by people (compared to all the other factors)? The Climate Change for which we’re doing cost analysis here is “people-caused” (anthropogenic). So….100%. haven’t we done enough already? No. That’s the point of the article. Because it costs much more to delay – which is the point of the study. All in all, it’s far cheaper to take action now – we save on fuel bills, military costs, climate change costs, non-CC pollution costs, occupational health costs, etc., etc. “The changes in CO2 track ocean surface temperature, not global carbon emissions. Burning fossil fuels is not increasing atmospheric CO2. Recovery from the Little Ice Age, driven by the sun, is causing the oceans to release CO2. “The Little Ice Age was a period of cooling that occurred after the Medieval Warm Period. While it was not a true ice age, the term was introduced into the scientific literature by François E. Matthes in 1939. It has been conventionally defined as a period extending from the sixteenth to the nineteenth centuries, or alternatively, from about 1350 to about 1850, though climatologists and historians working with local records no longer expect to agree on either the start or end dates of this period, which varied according to local conditions. NASA defines the term as a cold period between AD 1550 and 1850. So what is anyone physically doing to “mitigate” climate change? Sure are a lot of critics and opinions. “China has embarked on the greatest push for renewable energy the world has ever seen. A key element involves more than doubling the number of wind turbines in the next six years. Already the world’s largest producer of wind power, China plans further massive increases. From a current installed capacity of 75 gigawatts (GW), the aim is to achieve a staggering 200GW by 2020. China added two US equivalents of coal consumption in the ten years to 2012. It added the equivalent of 15% of US coal consumption in 2013 alone. Between 2012 and 2020, China will add another US equivalent of coal consumption. This despite being the leader in installing gas, nuclear and renewable power. Sure. China has always been crystal clear: preventing climate change is a high priority, but crash economic growth is the highest priority. The question was: is anybody doing anything? And, for instance, we saw above that China is investing $400B in windpower. So, if we apply inefficient and unreliable expensive technology to attack 3% of a perceived problem, how does that translate into a solution? that is an expected development, with more REs the energy-only market (you sell kWh) does not work any longer. As a result more positive and negative power (kW) is sold. What is the problem? With decreasing wholsale prices an alternative for the utilities. “…power plant operators to adjust output 1,009 times to keep the grid stable last year, compared with 209 times in 2010…” that is one job power plant operators, that they have to perform this task more often now does not necessarily indicate severe problems, this is only implied in your source. It’s not that REs can’t supply electricity, it’s that government mandating specific amounts over specific time seems to have a counter-productive aspect to it. If cost is not an issue in your economy, then have at it. The author is unable/unwilling to get the basics right, his conclusion is nonsense. Hint: The killer of conventional baseload capacity is not PV, that is only the icing on the cake, the real issue for the utilities is onshore wind and the fact, that this production capacity is in hand of farmers and energy cooperatives. Whether Germany adds 2 GW PV per year or 5 GW, does not really matter. Even in best case PV-scenarios we have a share of only 20% of electricity generation. German domestic demand is around 530 TWh, 1 GW PV gives 1 TWh per year, therefore 3 GW difference for two decades is only 60 GW or 60 TWh energy per year. In contrast, onshore wind is in the 50-70% range in most scenarios. The fate of the energiewende ist determined until 2030, when very likely around 55-60% of the electricity generation would come from REs, by the ability of the large utilities to stop onshore wind. As long as onshore wind is cheaper than new coal capacity the utilities have a very basic economical problem. It is altogether possible that technology improvements will salvage REs from their cost disadvantages, but for now it is “jumping the gun.” Just because something can be mandated does not mean it should be implemented when there are so many issues both technically and economically. Here in Michigan, the electric utilities are faced with a government mandate to generate 10% of the electricity from wind while, at the same time, a court ruled that the present technology is adversely affecting the health of a nearby community due to sound levels from the turbines. If you read carefully the source you linked, you’ll see that this is incorrect: the human component of overall CO2 inputs is relatively small, but the human component of the CO2 stored in the atmosphere is much larger. It’s “flow” vs “stock”. The CEA report is repeating the same tired, old arguments for global warming alarmism. There is nothing new in the report and no reason to take any action. And in fact, I don’t think the Administration expects anyone to take any action, other than themselves. As usual, the report understates the significant uncertainties in the global warming argument, pretending that scientists have quantified the risk so that it is sensible to discuss costs versus benefits. But as I and other commenters have noted before, the dire predictions of global warming are produced by complex computer models of the world environment over a horizon of 100 years. These models cannot make testable predictions at long horizons so their forecasts cannot be verified. Even worse, these models cannot model very significant feedback mechanisms in the atmosphere such as clouds and must parameterize these processes with a series of fudge factors. These models can’t even match the temperature record in sample, failing to reproduce the current 17-year lull in the temperature. To all that uncertainty, you have to add the uncertainty about the knock-on climate effects of rising temperature and the consequent uncertain economic effects–50 to 100 years out! The global warming argument is speculation squared and the only reasonable way to react to this is to do nothing. Perhaps if the authors of the CEA report waited 30 years, they might be able to come up with something new to say. Given that these endlessly repeated global warming arguments have not really changed public opinion to date, why has the Administration bothered to release the report at all, given virtually no chance that anything will come of it through the legislative process? The Administration just needs some cover to bypass the legislative process yet again and issue more executive orders. But if the CEA report provides no justification for passing any new laws within the constitutional process, how can it justify unilateral, extra-constitutional executive actions? You see, in science, you don’t prove the theory by showing that it describes the existing observations. You prove the theory by showing that it predicts data that haven’t been observed. I expect nothing less. I really do think you are on better ground defending Mitt Romney’s assertion that a normal recovery has 500,000 jobs created per month. More basis for laughter at least! My statement about the scientific method is absolutely correct. I’m pretty stunned that you continue to challenge it, since it shows a fundamental misunderstanding of how science works. Rick Stryker: What’s all this stuff about hypothesis, data collection, testing, theory? Why do in-sample analysis? Gauss-Markov, pshaw. And then you dismissed the ex post simulation paper by Kaufmann et al., discussed in this post. That’s why I despair of getting anything sensible out of you. You seem to be saying something about data collection, in sample analysis, and the Gauss-Markov theorem but I’m not sure what any of that has to do with the point I made. Global climate models don’t satisfy either Friedman’s or Smolin’s statement of the requirements. I would also remind you that I did not dismiss the Kaufmann et al paper. I merely pointed out in this comment that that paper is not relevant to the point I was making about the climate models. In that comment, I also went into some detail on the problems with the models, pointing out that the partial differential equations that are solved in the climate models cannot be discretized finely enough to model cloud micro physics, for example. your statement indicates you have never done scientific research. fair enough, most people have not. but do not pretend to have expertise in an area where you obviously have no experience, simply a regurgitation of a statement you heard somewhere else. i repeat, your comment indicates you have never done any scientific research. period. Yet another non sequitur from you. stryker, am i correct that you have never conducted any scientific research? policy, think tank type studies perhaps. but not rigorous scientific research. Menzie, stay on topic. Did you actually have a point? Which false premise to attack first? 1) Warming is actually bad. To date, other than models-based estimates and exaggerated and scientifically unsupported claims of extreme weather, warming has actually been beneficial. 2)Warming is caused only by Anthropogenic CO2 (ACO2) and not Natural CO2 (NCO2); therefore, the ~0.8C of total warming in the ~135 years of measured records is man made. 3) Warming does not add CO2 to the atmosphere; therefore total CO2 increase in is anthropogenic? ACO2 makes up ~3.25 to 3.27% of the total atmospheric CO2. We are therefore trying to mitigate only this small percentage of the total. 4) US mitigation efforts as currently proposed by the EPA will have an effect on reducing warming. Using the EPA’s own partially funded MAGICC estimating tool, the TOTAL impact on warming from the EPA’s power plant goals will be ~0.02C (0.018°C actually) by 2100. We can not even measure that change. How would we even know? Considering that US ACO2 makes up ~40% of the total annual ACO2, getting the rest of the world to adopt similarly stringent standards would result in an additional ~0.03C of cooling by 2100. Yes, those number represent actual estimates of mitigation impact. Do the math yourself. While your looking up the quantities needed to do the math look up the estimates of costs. The US Camber of Commerce has estimated the costs of the EPA coal plant regulations at ~$30B/Yr, sot calculating the costs for this single set of regulations into the mid 2030s gets us costs in the $500B range for an infinitesimal reduction temperatures. You can have a theory without predictive power. It’s just useless. if observations exist which contradict existing theory, then that theory needs to be improved or discarded. when a new theory is developed which explains those observations, it is given credibility because it explains-predicts if you will-all of the observable data on record. predictions which are matched by future observations does not “prove” a theory-it only reinforces one’s confidence in the theory. you can show a theory to be faulty by even a single observation, but you cannot prove a theory with future observation and predictions because you typically do not know the entire spectrum of outcomes to measure and predict. but you can increase your confidence in that theory. on the flip side, observations which are not in agreement with the theory does not mean the theory in its entirety is to be discarded-it may simply need to be modified. again you will not “prove” the theory, but you will increase confidence in the theory. i think you really need to reassess what you mean by “prove” a theory. as a side note, we are sloppy around here but there is a distinction between theory and hypothesis. issues related to global warming are really a hypothesis. in science, a theory is a much better defined framework describing the behavior of a system. i would dare say there are few if any proponents of global climate change on this site who would rank the current framework as a “theory”. again a technicality, since most folks do not think in term of this distinction, but the requirements for a theory are much much greater than a hypothesis. we are no there, yet. if my theory accounts for some previously unexplained observations, is it useless? You’ve moved from non sequiturs to refuting claims that no one has made. No one is claiming that “proving” scientific theories means that they are absolutely true and that if they are “proved” then it’s not possible to have an observation that contradicts the theory. Obviously, no scientific theory is ever proved in that sense. I am using proved to mean that the theory makes a non-trivial prediction about some hithero unobserved phenomena that is confirmed by subsequent observation. The example I’ve give in past comments is General Relativity, which made a precise and non-trivial prediction about how a stars light would be bent in the sun’s gravitational field. That prediction was subsequently confirmed by Eddington’s observation of a solar eclipse. Climate models only attempt to explain a subset of phenomena that have already been observed and arguably don’t do so well even with that. But to be credible, they need to make non-trivial predictions that are subsequently confirmed. Steven put the point in an alternate form. A theory that can only explain what you already know is useless. climate models are part of a hypothesis. as a number of hypothesis are proposed and confirmed, they will coalesce to form a theory. you are trying to impose the rigidity of theory onto a hypothesis-and that is not correct. a complete theory does not yet exist. over the past decades the models resulting from these hypothesis have improved remarkably well, and i see no reason to believe they will not continue to improve as more data is collected and models refined. and what will be your response when those predictions are confirmed, but we took no action in the interim because we had not yet “proven” global warming according to your view of the timeline of science? Peak Trader I think you’re misunderstanding Menzie’s post. The CEA analysis that Menzie posted simply relates the cost of achieving a carbon goal expressed as ppm to any delays in achieving that goal. The graph in Figure 2 offers three different CO2 ppm ranges and estimates the cost of achieving those targets. Reasonable people can disagree about what the right number should be…500ppm, 600ppm 700ppm…pick your favorite number. 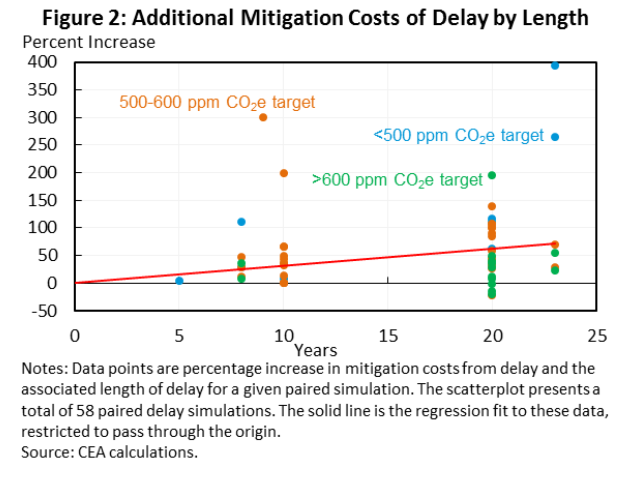 What the graph shows is the cost of delaying action relative to each of the targets. So obviously it will be very costly if your target is 500ppm and we delay abatement actions for 20-25 years. The percent of CO2 growth in the atmosphere since the dawn of the industrial revolution that is attributable to humans is 100%. And while you can make a reasonable case that there’s a lot we don’t know about the short to medium term climate response to increased CO2 levels, there should not be any doubt in anyone’s mind that CO2 does warm the atmosphere. That’s something that can be demonstrated in a lab. We know exactly why CO2 warms the atmosphere. What we don’t know is Mother Earth’s ability to absorb CO2, except that it’s not unlimited. We also don’t know when global warming reaches a point that is irreversible, although we do know that it will be roughly 100 years too late when we do know for sure. There are good reasons to believe that we are within one generation of reaching that point. This is a curious statement. A dozen years ago there was widespread agreement that global warming was real. Today that is less true. So public opinion has changed. Sad to say, we’ve gotten dumber. Apparently more people believe in a literal Creation story as well. Coincidence? The GOP has a lot to answer for in the dumbing down of Americans. The good news is that views on global warming tend to be generational, and fortunately the global warming deniers are (quite literally) a dying demographic. From Mother Earth’s perspective that cohort of voters can’t join the celestial choir soon enough. The other day JDH remarked that we were in a race between oil consumption and technology. With respect to global warming I think we’re in a race between growing CO2 concentrations and the grim reaper harvesting aging Tea Party global warming denier types. 2slugs, what are you trying to say here? “The percent of CO2 growth in the atmosphere since the dawn of the industrial revolution that is attributable to humans is 100%. If you are trying to say 100% of the growth of atmospheric CO2 is attributable The percent of CO2 growth in the atmosphere since the dawn of the industrial revolution that is attributable to humans is 100%.” If you are trying to say 100% of the growth of atmospheric CO2 is attributable to since the start of the industrial revolution. That’s wrong! Much of the annual increase of the CO2 is from natural sources. out gassing from the oceans as they warm is one of the larger sources. The ratio of naturally occurring CO2 (NCO2) to anthropogenic caused CO2 (ACO2) is ~24 to 1. If there is any error it is most likely in the estimates of NCO2. You go on to say this: “What we don’t know is Mother Earth’s ability to absorb CO2, except that it’s not unlimited. ” That is true, but just a 3% increase in absorption overwhelms the amount of ACO2. Since I think you believe 100% of the CO2 increase is anthropogenic, and we can not accurately estimate the absorption rate coupled with the higher likelihood that estimates of NCO2 are imprecise, then your statements contradict each other. No, we do not know how much of the total CO2 is caused by humans, and more importantly we cannot estimate the amount of warming caused by CO2 in the atmosphere, let alone the amount of that warming from ACO2. My point was that whether 12 years ago or today, the global warming alarmists have never really been able to convince anyone in charge to actually do anything substantial, despite much effort. 12 years with no temperature increases hasn’t exactly enhanced their credibility either. Well, the Chinese are spending $400B on windpower. 135 GW new wind cost in China less than 200 billion USD. My guess is, that the other half of the 400 billion USD is needed to provide infrastructure like HV transmission lines. I’m referring to the Chinese plan to install 200GW by 2020. Windpower costs about $2 per Wp (capacity) in the US, so I estimate a total cost of about $400B. Now, about $.25 of that US cost is long distance transmission to link it to the grid. China has somewhat longer distances, but I don’t think the cost difference is that large. Well, that investment in wind in china was being subsidized by features of the Kyoto protocol. But the Kyoto protocol is about as far as the global warming guys ever got and that’s pretty far from what they think really needs to be done about global warming. But even in that case, the US Senate never ratified the Treaty. I think it’s already expired. investment in wind in china was being subsidized by features of the Kyoto protocol. I’m not aware of any money going from the US or Europe to subsidize Chinese wind projects. I’d be curious to see links to more information. Data has been coming in cool. If this holds above a 0.4 deg C anomaly, then climate change talk will be back on the table. If it stays near current levels, I think interest in CC legislation will remain muted. Yes, and I would encourage readers to look at the data for the convergence of the Gleissberg and Suess cycles and possible planetary orbital effects on and geophysical forcing on the Earth’s crust, as well as influence sunspot activity, which could result from solar equatorial angular velocity and the implication for at least 20-30 years of mid-latitude cooling. Whether or not human activity is having an incremental effect on atmospheric warming, or whether anything can be done to mitigate the effects, could become a moot point in the next 20-30 years. Cooling with mega-drought conditions, Peak Oil, and population overshoot are likely to result in higher food and utility prices, falling real discretionary spending per capita, rising food insecurity around the world, and the predictable results for a large share of the world’s population spending 35-50% of income on food: ethnic/racial/religious conflict and violence, failed states, wars, mass migration, rising opposition to immigration, resentment of “the rich”, risk of loss of credibility and legitimacy of major institutions, social unrest, gov’t reaction, and so on. These factors imply that globalization has peaked and will likely disintegrate beginning at the weakest linkages with respect to availability of energy, food, and water resources. Steven, I’m waiting for the version 6.0 of their processing. Spencer already said the current test of that version reduces the divergence from RSS. RSS is at ~18 Yrs of no warming http://woodfortrees.org/plot/rss/plot/rss/from:1996.5/trend and ~16 Yrs 6 Mos of cooling http://woodfortrees.org/plot/rss/plot/rss/from:1998/trend. Many predict this trend to continue for a decade or two. Which makes this study incredibly untimely. CoRev You’re talking nonsense. All of the growth in post-industrial revolution (IR) CO2 is manmade. Ice cores going back 800,000 years show that CO2 concentrations were always between 180 and 300ppm, with very rare instances above 280ppm, which is the pre-IR baseline. Today we’re at 400ppm and growing fast. In that 800,000 year period CO2 never increased by more than 30ppm over a thousand year time span. It now takes less than 17 years to increase CO2 by 30ppm. To put that in perspective, more CO2 will be added to the atmosphere in the time it takes a kid to go from kindergarten thru college than all of the CO2 growth from Charlemagne to the Civil War. And it’s increasing at an increasing rate. Sorry, but all of the post-IR growth is CO2 is manmade. Still think warm temps are good, huh? My oh my. You do know that corn, wheat, soybeans and rice all have very narrow temperature ranges and do not tolerate heat well? Currently we are at the upper range of their tolerance ranges…well, actually rice has already gone past it. But hey, you’re a Tea Party guy, so it’s not like you really care if half the world’s population goes to bed hungry, right? You’ve got yours and that’s all that counts. And who cares if one small island nation will literally disappear sometime next decade. And it’s not like you know anybody from Bangladesh, so why care about those poor unfortunates. Their suffering is a small price to pay so that you can continue to crank up the air conditioner and roll down the highway in your gas guzzling RV, right? Rick Stryker My point was that 12 years ago most people were convinced about global warming. What made them stupid was fear stoked by the GOP. It’s basically a law of nature that people go into hunker down mode when economic times get tough. This usually means they take very myopic views (so much for Ricardian Equivalence!). One of the casualties of the Great Recession was a clear-eyed understanding of the long run threat from global warming. People just didn’t want to believe it because they feared it would make their economic prospects even dimmer than they already were. It’s a very knee-jerk conservative reaction. You see this kind of irrational behavior all the time. For example, look at how north Atlantic fishermen continually denied that the fish stocks were in trouble. Their own immediate economic interests did not allow them to admit reality, so they kept lying to themselves. And lo and behold, the fish stocks collapsed. We saw similar reactions with loggers in the northwest and coal miners in Appalachia. We’re also seeing it with oil interests today, although I suspect Big Oil actually believes global warming is real and that’s why they are so hell bent on getting as much out of the ground as fast as they can. They know the party will soon be over and a carbon tax is inevitable. 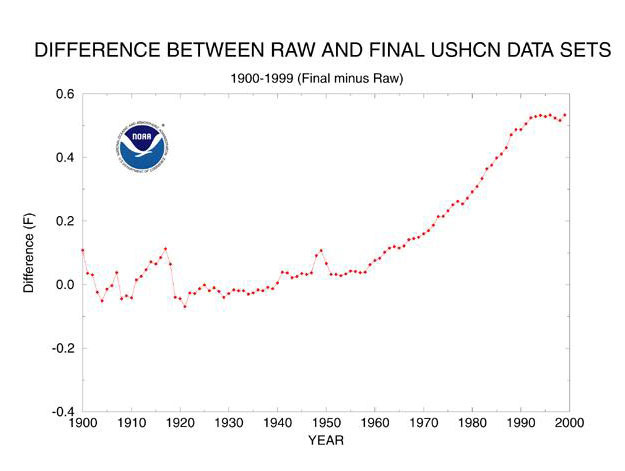 I have no idea why you and Steven Kopits think that global warming has stalled. All of the models that I’m familiar with from a dozen years ago (e.g., the NIST model) were predicting that the rate of warming would temporarily moderate because the sun was due for a predicted downturn in solar energy. The question isn’t why haven’t temps continued to increase as fast as they were in the 1990s and early 2000s, but rather why haven’t we seen any absolute cooling. Not just a moderation in the growth rate, but an absolute cooling. So this doesn’t bode well for when solar energy picks up again in a few years. Peak Trader I see that you’ve been taken in by the old “temps precede CO2 increases” canard, eh. I would explain the ice core relationship to you and why you are misunderstanding it, but perhaps it’s best left as a homework exercise. If you want a fairly clean, laymen’s explanation, check out Jim Hansen’s book “Storms of our Grandchildren.” He has a good explanation. Hansen was head of NOAA. No people’s views on global warming have been relatively stable over the last 12 years, as shown by this gallup poll. If you ask people whether they will see evidence of global warming within their lifetimes, a solid majority will say yes. 12 years ago, in 2002, 71% would say yes as opposed to 65% in 2014. So, that ratio is down a bit. But the more important question is how many of those people think that global warming will be a serious threat to their way of life? In 2002 it was 33% and in 2014 it was 36%. So, the percentage of people that are convinced by the global warming alarmists has actually gone up a little bit, not down as you are claiming. It’s a noisy series though and I think the reality is that the numbers are pretty stable. If Republicans have somehow made the public more stupid with respect to global warming, they sure haven’t been doing a very good job of it. My interpretation is the global warming guys have been able to convince a solid minority of about 1/3 that global warming is a problem, but they haven’t been able to move the needle much beyond that, despite much effort. Rick Stryker Interesting. But the Gallup poll does confirm my theory that people’s views on global warming tend to be driven by current economic conditions more than the actual climate facts. Notice how belief in global warming drops as the economy tanks and then begins to rebound as the economy recovers. Immediately before the Great Recession it was up to 75%, then quickly dropped to 63%. And among those who believed it would be a serious threat, support fell by 20% (from 40% to 32%) in just two years immediately after the recession hit. Yes, I think you are right that views on global warming are influenced by economic conditions. You can see it clearly in the polling data. And it makes sense intuitively. The analysis of air bubbles from ice cores has yielded a precise record of atmospheric greenhouse gas concentrations, but the timing of changes in these gases with respect to temperature is not accurately known because of uncertainty in the gas age–ice age difference. We have measured the isotopic composition of argon in air bubbles in the Vostok core during Termination III (∼240,000 years before the present). This record most likely reflects the temperature and accumulation change, although the mechanism remains unclear. The sequence of events during Termination III suggests that the CO2 increase lagged Antarctic deglacial warming by 800 ± 200 years and preceded the Northern Hemisphere deglaciation. Peak Trader Sorry, you aren’t understanding the issue. That CO2 lagged temperature in the ice cores is not in dispute. The issue is why. Hint: the answer does not help your case. Complete the homework assignment. Your point that people already knew that climate forcing was abating and therefore expected the temperature lull does not resolve the problem with the climate models. Yes, people already knew that but that’s part of the problem. The climate modelers have put those known forcings into the models. Nonetheless, the models can’t reproduce the lull in temperature in sample. The models run too hot. The explanation that the climate modelers have proposed is that the extra heat has actually gone into the deep ocean. So, we have the lull in temperature in real life but the models have not been able to capture the heat going into the ocean–hence the run too hot. But that explanation presents some problems. First, it’s an admission that the models aren’t properly capturing heat exchange into the deep oceans. The modelers try to explain that away by saying the models can’t really be accurate over short periods such as 15 years, but what’s the evidence for that really? In fact, where is the evidence for deep ocean explanation? When you really look at this whole enterprise, it doesn’t look very scientific. The models aren’t able to reproduce a major feature of the data in sample, and the best the modelers can do is to talk about the deep oceans, where there is very little evidence. Shouldn’t they be presenting evidence and measurements to support their explanation? In other words, the authors can’t find any evidence for the deep ocean explanation for the failure of the climate models. The authors go on to point out that much of volume of the deep ocean is unobserved. Although parts of the deep ocean show warming other parts, below 3600 m, show cooling. And, very problematic for the models, the ocean can respond to forcings from a thousand years ago. Do the models capture that? you should not mistake the models for the hypothesis-two distinct entities. i would ask you, if we are able to refine the models to capture the current atmospheric pause while still keeping the greenhouse gas influence in place, would you accept the future predicted results of significant man made changes to global climate? you and others are very much arguing the current pause in temperature is not predicted by the models, so throw the idea out the window. what if that changes? will you accept the models then? and did you accept the models in the early 1990’s, before the pause occurred? again you have been trying to argue because today’s models are not refined enough, quit looking at the problem. so they have not created the proper transfer function between the ocean and atmosphere. this issue has been pointed out recently with another poster. the problem is the sea level has been steadily increasing over the past 100 years, even during the current atmospheric pause. so energy is moving from the atmosphere to the ocean. but atmospheric temperature is steady, not dropping. if you think about it, this lends itself to the thought that either the atmospheric insulation level has increased or solar output has increased. neither lends itself to the “cooling” people have been talking about recently. 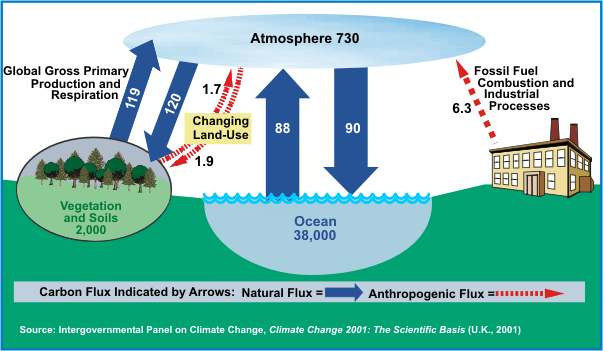 rising atmospheric temperatures or rising sea levels are both indicative of higher energy content in the earth system. you need to explain that away. I am pointing out a problem with the model in sample. Being able to explain current data in sample is a minimum requirement of a model. So, even if these models could explain the lull in temperature, that would not be enough for me to take them seriously. The point I’ve been making is that they need to satisfy the much stronger condition that they are able to predict phenomena not currently observed, i.e., that they make non-trivial prediction that are then verified. To put it another way, capturing the lull in temperature is a necessary condition for model accuracy. But it’s not a sufficient condition. rick, you are hedging. is there any way you would accept a model if it captured the current lull? saying it needs to capture future observations is required to confirm the model. but how long would you be willing to sit back and deny the model before accepting some of its outcomes? i ask this because i don’t really believe you would accept any prediction of man made global climate change until it has already occurred. and at that point, we have a model that works, but in the words of you and kopits, that would then be a “useless” model for all practical purposes. again i return to my comment about your lack of scientific research. obtaining experimental observation is costly and timely. you continue to acquire data when possible, but you do not put on hold your continued work on a model and its confidence level until the next set of observations-they could be a decade away. you do not always get your observations when you want them. the model is not useless until that observation occurs. the way you want to pass judgement would halt most scientific progress in its tracks today. 2slugs said: “Ice cores going back 800,000 years show that CO2 concentrations were always between 180 and 300ppm, with very rare instances above 280ppm, which is the pre-IR baseline.” Those same ice core samples showed that CO2 increases lagged warming cycles. We’re in a warming cycle so it is expected that CO2 would be increasing naturally. Yes, some ACO2 is from man’s burning, but the amount is still ~3.25 to 3.75% of annual total. Can we tell which molecule is natural and which is probably from fossil fuel burning? Yes, but with great difficulty, in lab environs, and some significant error bars. What are the odds we can tell the atmospheric make up at any given time? Nil. BTW, you do know the value of appending unsmoothed, high density volatile data to a low density highly smoothed dataset, and from that combined data making evaluations. With precision? With any real value added by the appended data. Know what we often get? Hockey sticks. That’s what you just did with your ice core example. We’ve had no warming for 17 years 10 Mos in the RSS data. The average for all the major dataset is 15Yrs 4 Mos. Even your oft repeated claim about temperature and crop production ignores the fact that these crops are grown in many of the hottest climates just by varying the planting seasons to achieve optimum conditions. Its exaggerated interpretations, such as yours, that gets “Alarmists” into trouble. OLE MOM nature is the final arbiter and she is laughing. Here is a recent article that describes how chinese wind power developers had been applying for funding through the Clean Development Mechanism of the Kyoto protocol. Yes, that may be right about the level of funding being low. Tricorona claims that the wind power capacity they’ve installed in China and India was made possible by funding from the CDM system. This reference points out that 80% of CDM projects were in China and India, with the vast majority in China. But the article also implies that the actual funding levels were low. CDM funding seems to have stimulated the development of wind power in China but it’s difficult to say by how much. UK Professor Emeritus of Biogeography Philip Stott of the University of London explains the crux of the entire global warming debate and rebuts the notion that CO2 is the main climate driver. Former Harvard University Physicist Dr. Lubos Motl dismissed any significance to 400ppm of CO2 in an essay on May 12, 2013 titled “Why we should work hard to raise the CO2 concentration”: “CO2 is primarily plant food while its other implications for Nature are negligible in comparison. Humanitarian orgs should work hard to help mankind to increase the CO2 concentration,” Motl wrote. “’CO2 is the key compound that plants need to grow – and, indirectly, that every organism needs. Ivy League geologist Dr. Robert Giegengack, former chair of Department of Earth and Environmental Science at the University of Pennsylvania: “It’s hard for us to say that CO2 drives temperature. It’s easier to say temperature drives CO2,” he added. As you can see in the chart in the link above, CO2 increased only 85 ppm when the earth’s human population more than doubled, from 3 billion to 7 billion. Maybe, that small amount of CO2 is coming from people breathing. peak, yeah that was a real scientific study. a graph with no analysis. it was captioned in a way to walk weak minded folks down the path of innuendo you just repeated. brilliant! of course that is what the graph was implying. silly me. People don’t create CO2 – they get it from the food they eat, which in turn comes from plants, who in turn pull it out of the atmosphere. There’s no net gain. oops – I meant carbon, of course. I can’t fathom why someone goes against the obvious. Is it for money? It’s just to be against the democrats, no matter what? Marco, to which obvious do you refer? The one that says the Antarctic has been ice covered for millions of years and its glaciers calf, or the obvious that make that sound alarming? by agents of the State. Power to the Planet, Power to the Statist! That’s an idea spread by the oil industry, hoping to scare and confuse people. In fact, a simple set of excise and fuel taxes would do the trick. Those taxes exist already, so no new regulations are needed. There’s nothing complex or intrusive about it. No socialism, no state control. Now, if you object to that, you simply object to phasing out fossil fuels. That’s a different issue. It’s not a question of socialism vs freedom. The only reason we haven’t simply raised existing taxes is the ferocious resistance of the oil industry (others, like the car industries, have been a big problem here too). Because simple taxes have been pushed out of the political mainstream (remember “no new taxes!”? ), there’s been a movement to more complex things like cap and trade. But, simple existing taxes would be best. Every economist will tell you that. How do the people who wrote the report know any of this? How accurate are their assumptions and how good are the models that they use as the basis of their analysis? Vangel: I provided a link to the study’s main author, James Stock, at the beginning of the post. I think you should click on the link, and read his cv. I believe you will then have the answer to your question. The link does not answer anything. We are still dealing with models that have a very poor forecasting record and assumptions that can easily shown to be questionable. First of all, there is no reason to suppose that we are at some ideal temperature or that any rise from this level will do net harm to humanity or the biosphere. Second, the average temperature is not meaningful given the fact that most of the reported rise comes not only from data which has been adjusted by the addition of a warming signal but that even the adjusted data shows that most of the warming comes from higher lows, particularly in the winter and in high latitude areas that could benefit from warming. Third, the satellite and radiosonde data shows no statistically significant atmospheric warming for nearly 18 years even though CO2 levels have remained at record highs and the ARGO data has shown that the expected accumulation of heat in the ocean has not been observed ever since the new and accurate system went on line in 2003. Note that this does not account for the fact that there is plenty of evidence that shows that natural factors are much more important than CO2 emissions and that the climate models used by the IPCC have overestimated the warming by more than 100%. Put it all together and there is nothing to worry about. I suspect that you know that this entire debate has little to do wit the reduction in pollution or even temperatures. As usual, it is purely about money and power. Given the fact that the EPA has admitted as much. How do you think that voters will react when they find out that their energy costs will increase substantially and that their standards of living will be lower just so that the government can say that the temperatures by 2100 will be 0.02C lower than they would have been? and you have reason to believe that if we deviate from the historical temperature range in which humans significantly advanced their culture and technology, there will be better conditions? to justify your statement, you need to provide a thesis and model to show how elevated or lowered temperatures would be a superior environment for continued human evolution. this indicates a trend toward higher temperatures. how does this support your argument and contradict models which predict higher temperatures? Who says anything about deviating from the historical temperature range? Do you really think that the environment around Chicago will be harmed if average temperatures rise 1.4C due to a doubling of CO2? 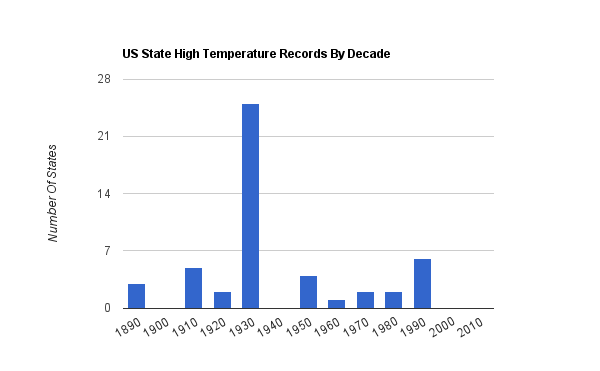 Note that most of the supposed warming, and I say supposed because it does not show up in the raw data taken at the weather stations, is due to an increase in the low temperatures, particularly in the winter and that for continually operating stations more state record highs were measured in the 1930s than in all the years since. If the 1930s were warmer why would I believe that the US is in danger of rising temperatures? Higher lows does not mean higher temperatures. And when you add a warming signal to the data the only place where the warming is taking place is the computers, not in the real world. Given the fact that you can’t tell the difference between the 50-year warming trend that ended in 1946, which is before the IPCC said that man had a material impact and the 50 year period that ended in 2008, which was supposedly driven by the record use of fossil fuels, why should we accept the claim that we are in an unusual period? Sea levels began to rise 18,000 years ago and the rate of increase today is not high when we compare it to previous periods. Global sea ice levels are above the mean and have not changed during the entire satellite era. We are still cool compared to the MWP, Roman Warming, or Holocene Optimum and have not seen a statistically significant increase in temperature for 18 years. The Accumulated Cyclone Energy Index is near modern lows, tornado activity in the US is extremely low, category 3 and higher hurricane landfalls have fallen, and losses due to weather as a percentage of GDP are not unusual. I see no problem in the real world. And you have yet to present any evidence that there is. we are not talking about local weather in chicago. we are talking about global climate change. that is a silly argument. so you are arguing the measurements have less volatility and the highs are dropping along with lows rising, so that average value does not change, that is mathematically how you need to justify your response. rubbish. but you have seen it hold steady, while the sea level has continued to rise. this is more energy into the system. Because there is no good, cheap green energy, the almost universal political choices have been expensive policies that do very little. There is much greater scope for climate policies to make the total climate cost greater through the 21st century. – Bjorn Lomborg . . . While this is not trivial, it by no means supports the often apocalyptic conversation on climate change. The cost of inaction by the end of the century is equivalent to losing one year’s growth, or a moderate, one year recession. The cost of inaction by the end of the century is equivalent to an annual loss of GDP growth on the order of 0.02%. However, policy action as opposed to inaction, also has costs, and will still incur a significant part of the climate damage. Thus, with extremely unrealistically optimistic assumptions, it is possible that the total cost of climate action will be reduced slightly to 1.5% of GDP by the end of the century. It is more likely that the cost of climate action will end up costing upwards of twice as much as climate inaction in this century – a reasonable estimate could be 2.8% of GDP towards the end of the century. Climate action will harm mostly the poor. Examples from Germany and the UK are given. To tackle global warming, it is much more important to dramatically increase funding for R&D of green energy to make future green energy much cheaper. This will make everyone switch when green is cheap enough, instead of focusing on inefficient subsidies and second best policies that easily end up costing much more. I also encourage posts on the work of Bjorn Lomborg and Economics Nobel Laureates with the Copenhagen Consensus to prioritize humanitarian projects. According to the World Health Organization, about seven million deaths each year are caused by air pollution, with the majority a result of burning twigs and dung inside. . . . while global warming causes another 141,000 deaths. “We are now carrying on activities and making decisions which will have have lasting, often irreversible effects on the well being of ourselves, our environment and of our descendants. . . .
International recommendations are for industrialised countries to reduce CO2 and methane emissions by over 80% of 1987 levels by 2050 to allow for some expansion in developing countries (Enquete-Kommission 1990). . . .
A quarter-century after 1990, the outturn to date – expressed as the least-squares linear-regression trend on the mean of the RSS and UAH monthly global mean surface temperature anomalies – is 0.34 Cº, equivalent to just 1.4 Cº/century, or exactly half of the central estimate in IPCC (1990) and well below even the least estimate (Fig. 2). Source: Global Temperature Update – Still no global warming for 17 years 10 months Christopher Monckton, Watts Up With That August 2, 2014. 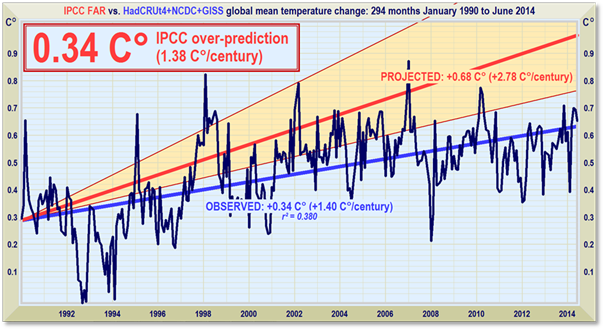 By the scientific method, As a scientist & research engineer, the IPCC global warming models are “Not Proven”! Their sensitivity is ~ 200% what it should be. James Hamilton’s publications show that our critical need is replacement fuel, not climate mitigation. See the massive impact on North Korea of losing a large portion of its liquid fuel imports – including famine! Lomborg is highly unrealistic. Wind power is cheaper than new coal in the US – just thoroughly scrubbing mercury, sulfur, etc., from coal makes it more expensive than “green” energy. Add in the cost of greenhouse gases, and wind becomes much cheaper, and solar is close behind. Hybrids, PHEVs, EREVs and EVs have lower Total Cost of Operation than Infernal Combustion Engine vehicles. That’s without figuring in the value of reduced pollution and increased national security. Fossil fuels are dirty, expensive and risky. There is no excuse for delay. I further encourage you to post on the impact of the renwable energy policies of Germany and the EU and why they have doubled costs to consumers and are causing a major destruction to the EU’s energy intensive industries. Cost of renwables doubled Germany’s residential electricity to $0.38/kWh – triple the US $0.12/kWh! Development and Integration of Renewable Energy: Lessons from Germany Hans Poser et al. July 2014. FAA Financial Advisory AG (Finadvice). e.g. well-intentioned policymakers in Germany and other European countries created renewable energy policies with generous subsidies that have slowly revealed themselves to be unsustainable, resulting in profound, unintended consequences for all industry stakeholders. . . .clearly generated disequilibrium in the power markets, resulting in significant increases in energy prices to most users, as well as value destruction for all stakeholders: consumers, renewable companies, electric utilities, financial institutions, and investors. . . .
European Union (EU) is expected to lose one-third of its global market share of energy intensive exports ;over the next two decades due to high energy prices, expensive energy imports of gas and oil, as well as costly domestic subsidies for renewable energy. Consumer prices are only part of the picture. Industrial/commercial prices have behaved differently. Inflation adjusted prices should be used, and the cost of eliminating nuclear needs to be included. A German error in setting FIT prices doesn’t tell us much, and doesn’t even tell us their policy didn’t work: in fact, the purpose of the policy was to dramatically reduce the cost of solar power, and it succeeded. One way to frame this: German rate-payers gave the rest of the world a large gift. A vague reference to grid instability isn’t helpful – the German grid’s rate of outages (the basic measure of grid reliability) has actually decreased over time. . . .Germany’s drive to almost double power output from renewables by 2035 has seen one operator reporting five times as many potential disruptions as four years ago, raising the risk of blackouts in Europe’s biggest electricity market while pushing wholesale prices to a nine-year low. . . .Tennet TSO GmbH, Germany’s second-biggest grid operator, told power plant operators to adjust output 1,009 times to keep the grid stable last year, compared with 209 times in 2010. The interventions, used alongside the balancing market, are expected to be as frequent this year as in 2013, Ulrike Hoerchens, a spokeswoman for the Bayreuth, Germany-based company, said by phone on July 23. To adapt to volatile supply and demand, RWE invested as much as 700 million euros on technology for its lignite plants that allow the units to change output by 30 megawatts within a minute. The coal-fired generators were originally built to run 24 hours a day. Baffling below: Please explain why Germany panicked, dropping perfectly good reliable nuclear plants with “no CO2”? Again, as I said, there may be more variance in the generation inputs to the grid, but the German grid is actually more reliable than ever. To clarify: we’re talking about “potential” disruptions vs actual disruptions. The German grid is currently experiencing fewer actual outages. “Baffling below: Please explain why Germany panicked, dropping perfectly good reliable nuclear plants with “no CO2″? Fukushima. Educate yourself on German energy policy and world events. When comparing, do full apples/apples engineering comparison for the same grid reliability and with full costs without tax subsidies. Even though wind power has been subsidized from 10 to three or four cents, electricity rates have been increasing significantly in regions with the highest wind penetration levels (five to 10 percent), due to extra transmission and integration costs (that have often not been accurately reported by utilities). The Lawrence Berkeley National Laboratory has found capital costs for transmission lines are triple those of other generation sources due to the lower capacity factors of wind at about 30 percent compared to about 90 percent for base-load plants (7). Transmission costs are also driven higher by the need to locate windmills further from load centers. Typically, ratepayers must pay extra transmission costs of about two cents more for wind power (e.g., three cents compared to one cent or even less for base-load generation). . . . The Organization for Economic Co-operation and Development has estimated grid-level system costs are at least 1.6 and 1.9 cents for wind penetration levels of 10 and 30 percent respectively, compared to only 0.05 cents for natural gas generation (8). . . . Moreover, wind backed by peaking (that is at most 30 percent efficient when trying to back up wind) uses as much natural gas and emits as much carbon dioxide and other pollutants as just using combined cycle at 60 percent efficiency (without wind power). wind backed by peaking (that is at most 30 percent efficient when trying to back up wind) uses as much natural gas and emits as much carbon dioxide and other pollutants as just using combined cycle at 60 percent efficiency (without wind power). That assumes that we’re comparing a combined cycle plant with a windfarm and a single cycle plant (each of which produce 50% of the total). That makes no sense. Peaker plants would be used for *far* less than 50% of generation in any possible scenario. It also exaggerates the efficiency of a combined cycle plant (60% is very hard to achieve) while underestimating the efficiency of a single cycle plant. 2nd, the idea that US windpower would cost 10 cents per kWh, let alone a multiple of that, is highly unrealistic. That gives us a total cost of $1,800 per kW. The article also tells us that capacity factors “range from below 30% to over 40%…we use a single capacity factor of 35%”. That gives us production per year (8,760 hours x .35) = 3,066 kWhs. If we assume an interest rate of 7%, and a 25 year life, we can calculate the cost per kWh with a simple excel formula to amortize the annual capital cost (Interest rate, Time of repayment, Principal). We divide the annual capital cost by production of 3,066 kWhs, which gives us 5.0 cents per kWh. That’s without subsidies of any kind. That’s less than new coal or nuclear. That analysis is just dishonest. I’m embarrassed for Robert Rapier, whose website published it. you must certainly agree the removal of nuclear energy in germany is a driving force in the increased cost of energy in germany, in addition to their need to “import” oil and gas. i encourage you to understand the impact of nuke plants on the german energy landscape before pushing your agenda further.